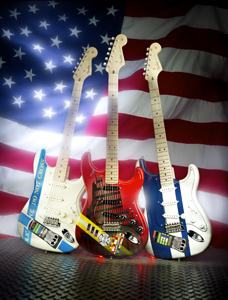 On the tenth anniversary of Sept. 11, 2001, the Fender Custom Shop offers its own sincere tribute to those who fell that tragic day with a special offering -- a remarkable trio of custom Stratocaster guitars commemorating the events and the heroes at the World Trade Center complex. “Even though I don’t play guitar, I thought it would a good way for me to honor those who perished on Sept. 11 and those who are still suffering,” he said. “And I always loved sitting back and listening to my son play guitar. That’s when I thought of a guitar. I’ve always felt as if music and art combined together is a good way for a person to express his feelings.